Home > Aluminum Dog Boxes > Do-It-Yourself > Dog Box Sliding Vent Assembly - 9.5" x 23"
This is a single replacement dog box vent assembly which includes outer vent frame with pre-drilled mounting holes, bars, and heavy-duty diamond plate slider door. 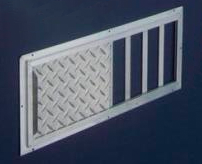 When the slider door is slid closed across the vent opening, the dog box wall will show through the opposite side of vent assembly, allowing for complete closure of the vent for colder climates. There is no fixed diamond plate piece in the vent assembly. * To mount on a home-made box, your vent opening should only be approximately 10"W x 7.5"H. We recommend waiting to receive the product to use for proper measurements and placement before cutting the vent hole. Manufactured by Owens Products, Inc. Shipment is via USPS, UPS or FedEx Ground with Signature required.